Coca-Cola Nigeria has kicked off another spectacular campaign to rally fans behind the Super Eagles on the road to Russia for the FIFA 2018 World Cup tournament. The Official Soft Drink Sponsor of the Nigerian national football team, which has been rewarding fans with its ‘Score a Trip to Russia’ promotion for the past six weeks, has announced it is giving fans another chance to join in the excitement of the games and show their love for the Russia bound team with the release of a special edition Super Eagles branded Coca-Cola packaging. The special edition Super Eagles branded 35cl and 60cl PET Coca-Cola original bottles will be released as an extension of the globally acclaimed Share-a-Coke campaign. 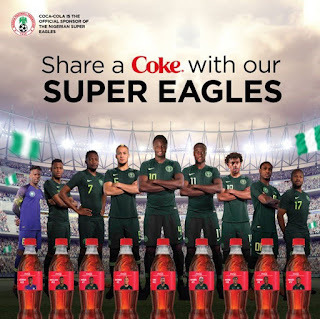 Tagged ‘Share-a-Coke-with-Super-Eagles’, the new campaign sets images of each player in the Super Eagles Russia-bound team on the Coca-Cola bottles. The images which are detachable will provide fans an opportunity to collect pictures of their favourite players and show their support for the Super Eagles Team. “Throughout this football season, we are keeping with the promise to bring to our consumers upliftment and positivity in every sip. 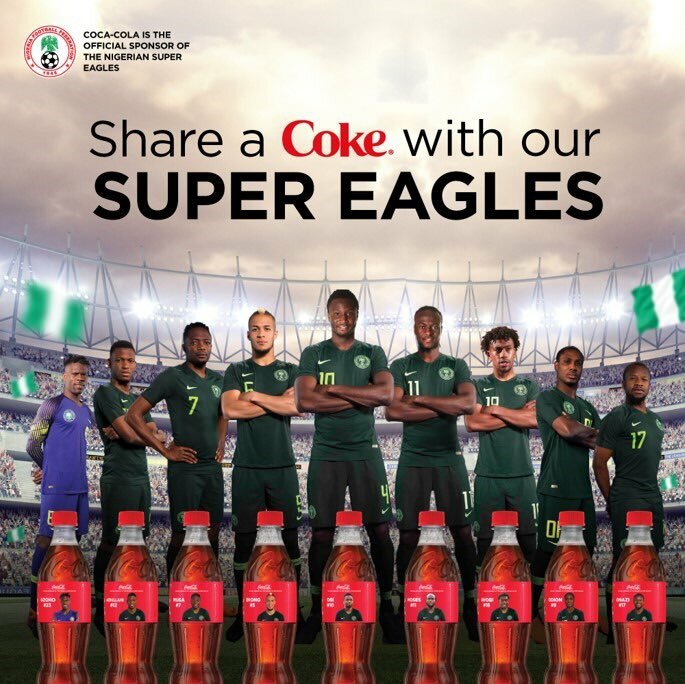 With the release of this specially branded bottle, Coca-Cola is once again thrilled to join millions of fans around the world in their support for Nigeria’s Super Eagles. We’re toasting the Super Eagles and fans to celebrate the start of this electrifying football season” said Cletus Onyebuoha, Strategic Marketing Manager for Coca-Cola West Africa. This new development comes hot on the heels of Coca-Cola’s ongoing “Score a Trip to Russia” Promotion in which lucky participants will get a chance to travel to Russia to watch the FIFA World Cup games live on an all-expense paid trip courtesy of Coca-Cola. The promo, which randomly selects winners after weekly draws, is set to take a total of 22 lucky winners to Russia. So far, 15 winners have emerged from all over Nigeria, most of whom are ordinary people, who have been attesting to the magic of Coca-Cola: that the simple pleasure of drinking a Coca-Cola can make an ordinary moment special. As part of its multi-million-naira partnership with the Nigeria Football Federation (NFF), Coca-Cola Nigeria Limited has lined up a bevy of activities that will be rolled out in the run up to the World’s most popular sports competition to take place this summer including several consumer touch points, such as marketing activations, in-store and social media engagement. Speaking on Coca-Cola’s support of the Super Eagles, the President of the Nigeria Football Federation, Mr. Amaju Pinnick said, “We are happy that Coca-Cola has come on board as the official soft drink sponsor of all our national football teams including the Super Eagles. As a giant in football globally and the official partner of FIFA World Cup™ Russia 2018, Coca-Cola’s goodwill is important to us like that of 180 million Nigerians. We are therefore proud to partner with them and excitedly looking forward to a successful Super Eagles outing in Russia”. Keeping with the tradition of releasing an anthem during every FIFA World Cup season, the soundtrack for this year’s Coca-Cola’s FIFA World Cup activations will be the inspiring anthem ‘Colors’ written and recorded by global superstar Jason Derulo. The song will fill Nigerian airwaves throughout this football season. For now, football fans can look out for the Super Eagles branded bottles that will be available in stores across the country from May 15th 2018.